We've been working closely with film schools in Germany since our founding in 1999. 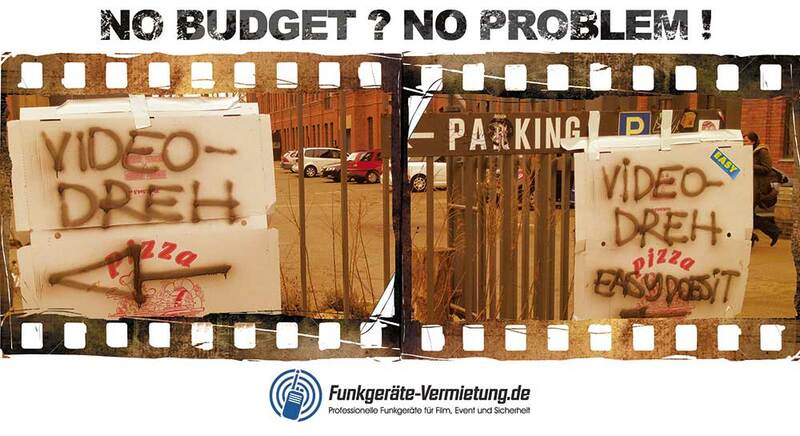 We know all about no-budget/low-budget events and film production – after all, we ARE based in Berlin (you know..."poor but funky"). Long story short: No budget? No problem! Do you provide equipment...or money? As a general rule, we only provide two-way radios, wireless microphones and accessories. Depending on the type and scope of the project, we'll provide you with equipment free of charge or at a steep discount. We've got lots of connections in the movie business, so if your concept seems very interesting or trendsetting, we'll be glad to help you contact other appropriate sponsors (in the film-equipment rental field, for example). When you sponsor a production, is everything free? That's decided on a case-by-case basis; we'll either offer you a deep discount or lend you radio equipment completely free of charge. Your concept and our current workload play a major role in our decision; if we're already sponsoring several events or film productions during the period you request, the likelihood that we can support you at the same time decreases significantly. Therefore, it's a good idea to plan ahead. How do I get discounted or complimentary two-way radios and wireless microphones? The best way is to get in touch with us by phone. Your contact is our colleague Gregor Borck. E-mail: mail@Radio-Rental.com; phone: +49 30 29381970. Describe your project and budgetary situation to him...and, of course, be sure to tell him what equipment you'd like, and when you need it. We're always interested to know if there's a website on which we can be listed as a sponsor and/or whether our sponsorship can be mentioned elsewhere, e.g. in the credits or on other advertising materials. Please follow up with a brief description of the planned production via e-mail: mail@Radio-Rental.com. How long until I get feedback from you about my sponsorship request? Our company has a rather flat hierarchy. It may take a bit longer in our busy season, but, by and large, you can expect to hear back from us the same day or the next business day. Do you also support school, university and student council events? Yes, in principle, but usually only with our university discount. Again, just ask and we'll be glad to see how we can accommodate you in some meaningful way. Do you sponsor commercial or for-profit projects? Do you reject any sponsorship requests? Yep. We don't support commercial concepts, sociopolitical approaches we don't agree with, etc. Still have questions about our sponsorship program? No problem! Just get in touch with us. We've always been able to find the right solution for any (or even no) budget, especially for film productions. We look forward to hearing from you!